As he just can't seem to help himself, the Trumpster twitters: "Nobody should be allowed to burn the American flag - if they do, there must be consequences - perhaps loss of citizenship or year in jail!" Here's my response: There is no right more fundamental to freedom of expression than flag-burning. It is the symbol of refusal to bow before this infant who would be king. It is the rejection of Trumps racist, misogynist, money-soaked worldview. It is the rejection of his terrifying cabinet appointments. It is the repudiation of his corporatist fascism. It is the single most powerful recognition that America has become America, Inc. It is an action in defense of the country. That Trump is already wondering aloud--on Twitter--about whether he can criminalize this most essential right tells us everything we need to know about his character, his motives, his assault on the Bill of Rights. And it's irrelevant whether or not he can outlaw flag-burning. He can't. At least not alone. That we should be burdened with a president so completely cavalier about the protections of the Constitution and the Bill of Rights is precisely why we must burn the flag. The first amendment doesn't exist merely to protect safe, conciliatory, or banal speech. As John Stewart Mill rightly argues, it exists to protect unpopular, offensive, vulgar, and woefully wrong speech. It protects Trump's insane climate change denial. It protects his references to Mexicans as "drug-dealers and rapists." It protects Trump's vulgar references to women as pigs and pussies. It protects Attorney General Nominee, and "career racist" Jeff Sessions' reference to black men as "boys." (https://theintercept.com/2016/11/18/career-racist-jeff-sessions-is-donald-trumps-pick-for-attorney-general/). It protects Chief Council Steve Bannon's antisemitic sentiments, and his "alt-right, "fake news, conspiracy theory driven, white suppremacist website, Brietbart. 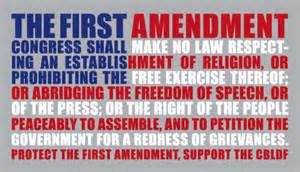 The first amendment protects all kinds of speech that is false, brutal, and divisive--even the completely off the rails ranting of Alex Jones' "Info-Wars," (http://www.infowars.com/). Burning the flag--that is an act that can and should bring us together against a fear-mongering white nationalist regime who will dispatch soldiers to die for a country that represents nothing more than Trump's latest scheme to fill his own coffers. And let's be very clear: we have every right to be protected from harm. There are important questions to be considered about whether hate speech constitutes harm. But these are far too sophisticated for either Trump or his entourage of sycophants to contemplate--especially as they jockey for greatest advantage to see out the narrow gauge that is the president's arse. We do not have the right to be protected from being offended, even disgusted. 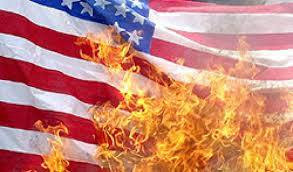 Burning the Americans flag is thus radically unlike the commission of hate speech. In fact, it's among the most important acts we can perform in the defense of the country. That Trump has no comprehension of this fact bespeaks a willful ignorance so profound that we should all shudder at the very idea that he could be president. He personifies not merely hate speech but a repugnant worldview now celebrated by the likes of the Ku Klux Klan, white nationalists, sexual assailants, and the willfully ignorant everywhere. That Trump apparently thinks he has the power to expel citizens from the country on the grounds of his infantile rants should leave us embarrassed and ashamed for our horn-swaggled neighbors who voted for him. Possibly the only thing more frightening than a Trump presidency are the emboldened bigots for whom hate speech has now been given a new lease on life, but who'd condemn the real patriot--the one who burns the flag in mourning over the death of the promise of democracy. What besides setting the flag to flames could more eloquently express this catastrophic threat to the Constitution and the Bill of Rights? What better way to recognize the preeminent importance of free speech? It is as gray and rainy in Northeast Pennsylvania this morning as befits the desolation of my mood. I ricochet between slack-jawed paralysis and an outrage that makes bloodless white-knuckled balls of my fists. I reached out my front door to pick up my newspaper, and it occurred to me that I am now afraid of my neighbors. I'm afraid, and anyone who values reason should be, of anyone--everyone--who voted for Donald Trump. 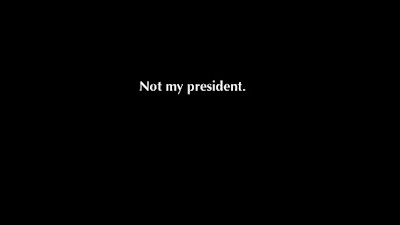 They have elected the darling of the white supremacist, the Ku Klux Klan--the idolator of the lynch mob. They have chosen a war-loving fascist whose "America First!" 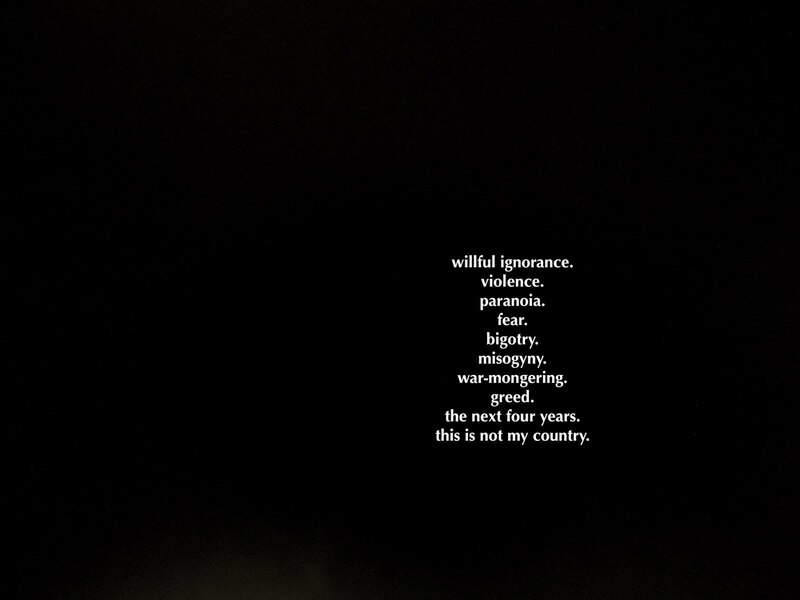 betokens an country with no place for civil discourse, for dissent, for self-reflection, or for humility. They have deemed fit for the most powerful office of the land a man who regards half the human population as disposable fuckable toys.